← AFTINET Forum – The Trans Pacific Partnership Free Trade Agreement and the US and Australian Elections . 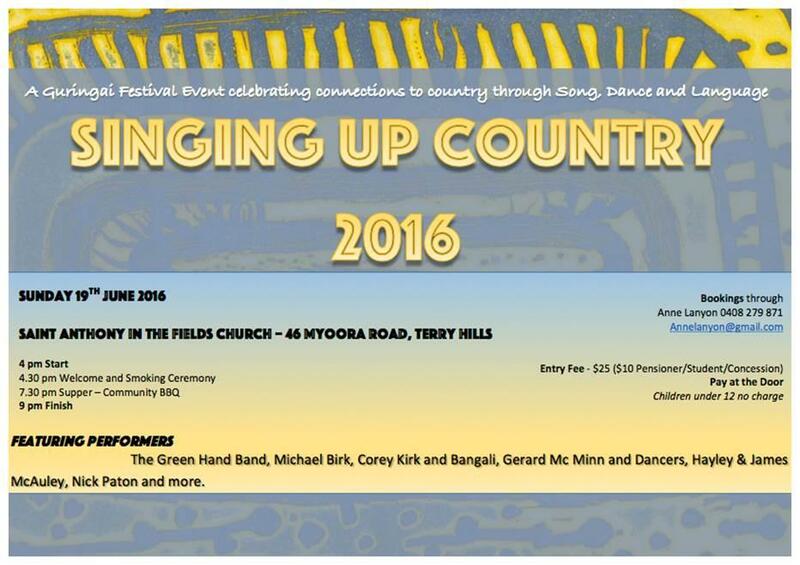 Don’t Miss the 2016 Singing Up Country Concert after the fabulous 2015 launch! Featuring young Aboriginal performers singing in Indigenous language as well as young Non-Aboriginal performers. This Guringai Festival event is part of the “Sharing the Story, Sharing the Land” partnership between the Frenchs Forest Catholic Parish community and the Northern Beaches Aboriginal community. Hosted by the FFCP Social Justice Group, the concert will be followed by yarning over supper and a campfire. Place: Saint Anthony in the Fields Church, 46 Myoora Road, Terrey Hills. Cost: $25 for adults ($10 Pensioners or Students), Children under 12 Free. Get your $3 or 2 for $5 Raffle tickets from Michael Birk on Facebook and Win a Limited Print of an original ‘intaglio relief ‘zinc plate etching by Jessica Birk.